Warriors Pre-Order Ends October 25! 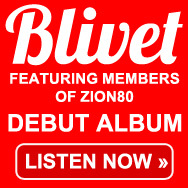 There’s just a few days left to pre-order Zion80’s new album WARRIORS. When you order you’ll get instant access to updates, videos, song downloads and more. Plus, you’ll get a full download of the music before it’s released to the public on November 1. And we have lots of other goodies available including signed CDs, t-shirts, VIP concert tickets and more. Next Next post: PARDES single out now!